Brick Fundraising - an easy way to build success! 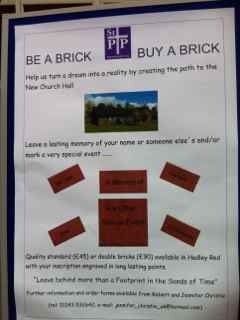 Brick fundraising is a great way to raise money for churches, schools, or sports and social clubs. 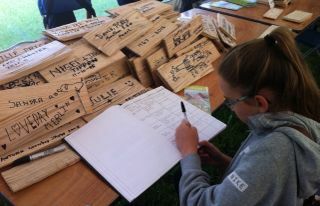 Supporters are asked to buy or sponsor a brick to be put towards a particular project. Usually some building works - A new hall, changing room, vestry, classroom etc for your organisation. Often this is recognized symbolically with sponsors or others who make serious contributions to a project having commemorative bricks or engraved brick pavers bearing their name. These are either used in the main construction work or used in a small project alongside the main fundraising focus in recognition of their support. Other organisations simply use the idea of bricks as a handy way of raising money. It turns projects into achievable measurable steps. Many people prefer to donate to a cause this way. Its easy to understand as the cost, the progress and the goal are all nice and clear. 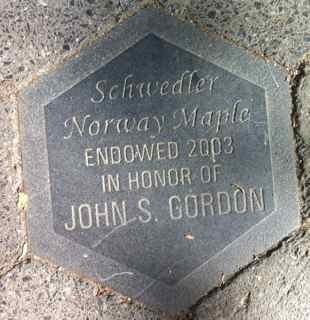 In Central Park New York City engraved paving stones are used to mark the sponsorship of specific trees. These are usually in memory of loved ones or to mark specific celebrations such as weddings or christenings. Prices start at $5,000. On a much smaller scale these engraved tiles mark donations by ex pupils to a school appeal. There are a number of companies who specialise in this type of project. They will engrave bricks, plaques and pavers with the names of your sponsors and supporters. Their services are not particularly cheap however it is an effective way of attracting and recognizing larger donations. Smaller organisations can still put a D.I.Y.plan into operation. Simply asking supporters to sponsor a brick for a fixed price is an easy to understand request. It is also simple to chart the progress of your campaign as you know how many you need to sell. Note: This may not be the actual number of real bricks needed for the project as it is likely that you can ask for more than the cost of a real one. It also makes it easier to incentivise the volunteers and supporters who will be selling the bricks. Suggesting that everyone tries to sell a certain number sets people a target and allows you to run a competition amongst your volunteers to see who can sell the most. A good idea to attract sponsors is to have people physically write their name on the brick in permanent marker pen. This might be on a face where it will show or on one that will not. It is a very visual idea and difficult for people to resist. It is also a great profile raiser for a project, particularly if you could take the bricks to a public space or shopping centre. Ask the company you are buying the bricks from for logistic support moving them. It's great advertising for them too. This might seem like a lot of work but remember you can charge more than the cost of the brick to sponsor one. Simple ideas like this can really capture people's imagination. Brick fundraisers can also be totally symbolic with supporters sponsoring virtual bricks online or adding their names to "Buy A Brick" posters etc. There are all sorts of novel fundraising ideas that could be used. Example- Volunteers are given a sponsorship form with a picture of a brick wall on it. They need to fill in the bricks with sponsors. Brick Fundraising campaigns tell an easy to understand, easy to sell story. With a little bit of hard work and imagination you will build something really special! 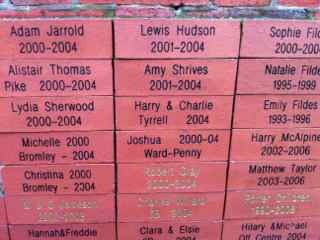 As you can see from some of the examples above its not just bricks that can be signed to raise funds. The famous Weald and Downland Open Air Museum in Sussex England has people signing chestnut roofing shingles which will be used on one of their reconstructed buildings. As this is a museum of old buildings the shingles must be used so that the name is hidden so a book is also signed to provide a record of who sponsored each shingle. As well as being a great fundraiser the initiative is also a great way of advertising the latest developments at the museum.